The "Hottest" Product We Sell, Literally!The Solar Spark Lighter is a unique pocket-size solar fire starter and lighter. It is a stainless steel parabolic mirror, like the one used to light the Olympic torch. It is designed to focus the sun's radiant energy to a precise focal point that can reach hundreds of degrees! 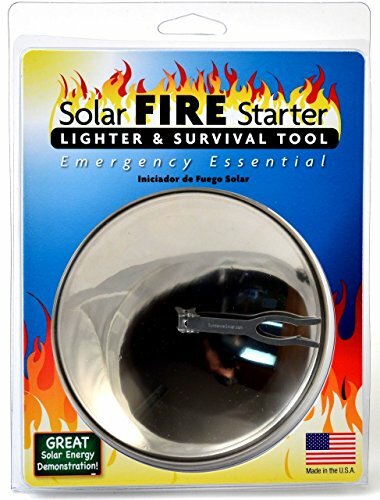 This great solar fire starter is perfect for backpacking, boating, hiking and as a great addition to a survival tool kit. Shown in the picture above with a cone of incense, just point it at the sun and it lights in seconds! Measures about 4.5" diameter. Can reach hundreds of degrees! If you have any questions about this product by Sundance Solar, contact us by completing and submitting the form below. If you are looking for a specif part number, please include it with your message.